Mohamed El-Erian discusses Brazils downgrade, technology's disruptive power and more. 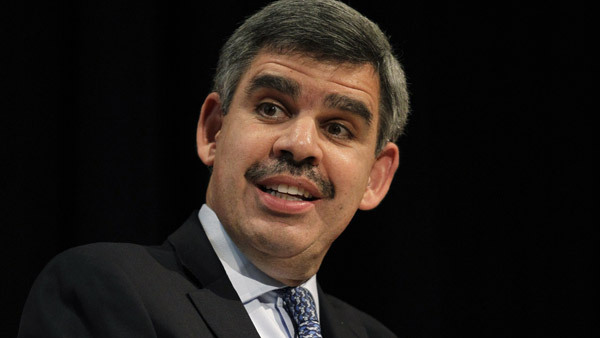 Mohamed El-Erian commented Friday on some of the more troubling spots in the global and U.S. economy. El-Erian, Allianz’s chief global strategist and PIMCO’s former CEO, discussed Brazil’s recent downgrade, the oil market, the unstable Chinese economy and the tech sector’s disruption of traditional industries in an interview with Bloomberg’s Betty Liu and Pimm Fox on Bloomberg Markets. Earlier this week, Standard & Poor’s lowered its rating on Brazil’s debt to junk status. And El-Erian doesn’t see Brazil’s situation changing anytime soon. El-Erian, who on multiple occasions has called the oil market “unhinged,” commented on a new report from Goldman Sachs that suggests oil could fall to as low as $20 a barrel in a worst-case scenario. “The oil market has been unhinged,” he told Bloomberg Markets. “It’s like the market for emerging market currencies. they’ve been fundamentally unhinged. They’ve had an earthquake. The oil market has had an earthquake on the supply side, on the demand side, and you know what, they’ve changed their swing producer, so the pricing dynamics have completely changed. While El-Erian said $20 a barrel is “possible,” he’s a little more optimistic. Regarding China’s slowing economy, El-Erian thinks the disruption in China has been financial more than economic. China predicts it will reach its growth target of around 7% in 2015, but El-Erian isn’t so optimistic. He predicts growth closet to 6%. “But I am a buyer that they can soft land the domestic economy but financial instability is going to continue because there’s such a bubble in the equity market there,” El-Erian said. El-Erian called what’s happening in the tech sector “very exciting” in its ability to disrupt traditional industries. He also discussed whether or not the tech space is sucking funding away from other businesses. — Check out Analyzing the Odds of a Fed Rate Increase on ThinkAdvisor.